Campaign leverages insights that teens and young adults look for upliftment to get them through the long second half of the day. Coke, with its unique great taste, helps them connect with friends and social media activities to help ease ‘Fear of Missing Out’, making the moment more special. Lift moods and energy every afternoon with new ‘Coke Music Playlist’ curated by top celebs ‘‘Toey – Jarinporn’ ‘V – Violet Wautier’ ‘June June – actress and DJ’ ‘Kaimook The Voice’ ‘Trasher Bangkok’ and ‘EDM Thailand’, launched via popular online music application ‘JOOX’. Over 50,000 JOOX VIP codes to download and listen to music on demand will be given for free as part of Coke Facebook activities. On-ground activities to enliven dull afternoons with uplifting games and prizes and free ice-cold Cokes, jamming with cool 95.5 Virgin Hitz radio DJs in various Bangkok locations. Bangkok (4 August 2016) – Coca-Cola, the popular brand of beverage in Thailand and in the world by the Coca-Cola system in Thailand, today announced the launch of its ‘Good Afternoon Starts with Coke’ campaign. The campaign aims to inspire young people everywhere who are busy living their lives either with work or school to have some fun during their afternoon breaks with an ice-cold Coke, the best anti-dote to afternoon slump so they won’t have to miss a good time with friends. To truly uplift consumers throughout the day and especially in the afternoon, the brand has teamed up with ‘JOOX’, the popular online music application to create the ‘Coke Music Play List’ and provides more than 50,000 codes for free song download. Coke will also continue its year-round program to hand out 2 million bottles of ice-cold Coke to consumers with special focus on the afternoon break during this quarter. Ms. Claudia Navarro, Marketing Director of Coca-Cola (Thailand) Ltd., said, “We’ve all been there; half-way through our day, feeling a bit lethargic! We dose off, struggle to stay awake….Well that’s the perfect moment to reach out for a Coca-Cola. The crisp, uplifting taste of an ice-cold Coke is the perfect antidote to this. We know this is important, particularly for teens who would hate to miss out on the action with their friends. Imagine, while you’re dozing off, the cute guy you like checks you out, or your friend texts you that she has extra tickets for your favorite artist’ concert, and you missed this because you were closing your eyes. Coke uplifts you with all its fizziness and great ice-cold taste. As a companion to this great, refreshing pause with Coke, we have also created “Coke Music Playlists” on Joox, curated by top music-savvy celebrities like ‘Toey – Jarinporn’ ‘V – Violet Wautier’ ‘June June – actress and DJ’ ‘Kaimook The Voice’ ‘Trasher Bangkok – and ‘EDM Thailand’. We have invited them to share with us their top picks of songs that make a great complement to Coke and the afternoon break. I really hope you enjoy them and share them.” said Ms. Navarro. Coke invites young people to enjoy ‘Coke Music Playlist’ via JOOX during dull afternoons. Big surprise!, more than 50,000 VIP codes to download and listen to music on demand will be given away for free. For more information, visit facebook.com/cocacolaTH. Mr. Nutivat Thamhatai, Public Affairs and Communications Director of Coca-Cola (Thailand) Ltd., said, “The new campaign is completely integrative with various activities to uplift and engage consumers. Our iconic ‘Taste the Feeling Truck’ will hand out perfectly chilled Coke at 3 degrees Celsius in glass bottles to uplift consumers during the hot and tiring afternoon breaks, with fun games and prizes hosted by 95.5 FM Virgin Hitz DJs. 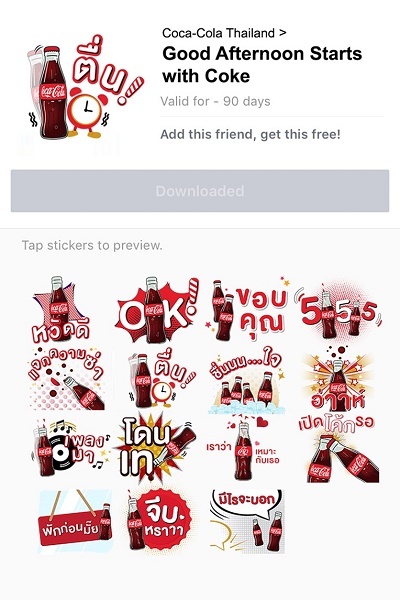 A new set of Coke LINE sticker, specially designed to be the anti-dote to dull conversations and afternoon slumps, is something to look forward to as well. Available for free download from 16 August onwards. 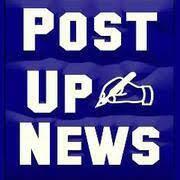 Following the overwhelming success of the latest Coke TVC, a new TV commercial will also be unveiled. The spot tells a story in a university canteen where a young girl misses out on what is happening around her and on social media, because of her afternoon slump. Coke comes to the rescue and turns an otherwise sluggish moment into special ones. Coke has carried out a comprehensive communication effort online and offline, including out-of-home advertising which will keep its ‘Taste the Feeling’ campaign current by focusing on encouraging young people to take better breaks with Coca-Cola so they are not missing out on important things, and can have special moments in the afternoon every day. The Coca-Cola System in Thailand consists of Coca-Cola (Thailand) Limited as the brand proprietor responsible for marketing activities, and its two local bottling partners – ThaiNamthip Ltd responsible for 63 provinces of Thailand, and Haad Thip Public Company Ltd serving 14 southern provinces. The Coca-Cola system in Thailand is the leader in nationwide market for non-alcoholic beverages. In addition to Coca-Cola, the most valuable brand in the world, the Coca-Cola system’s portfolio of beverages in Thailand includes Coca-Cola Zero, Coca-Cola Light, Fanta, Sprite, Schweppes, A&W Root Beer, Minute Maid Splash, Minute Maid Pulpy, Namthip and Aquarius.